Ancient reports of dreams and visions* typically treated these experiences — not as merely occuring in one’s head but — as experiences of reality itself. Speaking generally, the ancients did not make a clear distinction between the imagined world of dreams and the real and existent world of everyday waking life. The genres of ancient history and ancient biography are filled with records of dream and vision reports, which are placed, without embarassment, alongside the everyday reality of waking life. But the written dream or vision report did not necessarily, or even very often, correspond to the dream or vision as it was experienced. In the transition from dream or vision to dream or vision report, the experience would be slotted into the common form that the story of a dream or vision should follow. In writing down a typical dream or vision report, the ancient historiographer would include such stereotypical features as: a reference to sleep, a bed, or an unusual experience, the time or locality (especially if at an especially holy place), the startling shock in meeting the dream apparition or dream figure, an admonition such as, “be not afraid”, the appearance of a dream figure standing above (usually at the head of the sleeper, or confronting the visionary), the resulting surprise and bafflement of the dreamer/visionary, and reflections on the objectivity and vividness of the dream. One typical feature of ancient vision reports was that they freely expanded their account of the recipients of visions from a single person, to more than a single person, to even a whole army or town of people. Such ‘doubling’ of dreams and visions, as Oppenheimer explains, functioned as a rhetorical demonstration of the ‘truth’ of the dreams and visions. That is, if more than one person had the same dream, it must be true. 1. In 1 Corinthians 15, Paul reports that the resurrected Jesus was seen by one person (Cephas), and then by the Twelve, and then by “more than five hundred”, as well as by the early church leader and brother of Jesus, James, and by all the apostles (among whom Paul counts himself). 2. In Mark 16.1-8, three women are reported as ‘seeng’ a young man dressed in white (probably an angel), who informs them of Jesus’ resurrection. A later addition to Mark (16.9-20) exchanges this appearance to three women with a tradition of Jesus’ own appearance to Mary Magdalene alone, before his appearance to the eleven disciples. In both of these cases, there is a movement between individual sightings of Jesus and group sightings. Paul’s ‘sighting’ of Jesus is explicable as his famous visionary experience of the resurrected Jesus on the road to Damascus. Mark does not himself present the story as a vision, but the story that had come to him has many of the typical features of a vision report — suggesting that a vision report form underlies the Gospel resurrection narratives! The sighting comes very early in the morning, in the liminal time which commonly produces hypnagogic visions. The narrative is filled with verbs of sight. The women would be lamenting and mourning — activities which commonly induce visionary experiences. The young man acts as the angelus interpres of visionary experiences. And the reaction of speechlessness is typical of visionaries. It is interesting that the additions to Mark in Mk 16.9-20 join a tradition about a visionary experience — experienced solely by Mary Magdalene — to the group visions. The tradition about Mary Magdalene’s vision already varied between her individual vision (of Jesus) and a mass vision (of the angel). Although the literary report with three women is used in Mark, the comparative evidence — together with the plethora of early traditions about Mary Magdalene as a visionary — makes it plausible that the vision report concerning Mary Magdalene alone was earlier. The visions of individual visionaries were frequently written up in vision reports as the experiences of entire groups, armies, or even whole towns. Example 1: In ca. 648 BC, Ashurbanipal’s vision of the Goddess Ishtar (Astartes) was said to be shared by his whole army. Ashurbanipal explains that when his army reached the river Idide, his soldiers were too afraid to cross it because of its strong current. “But the Goddess Ishtar who dwells in Arbela let my army have a dream in the middle of the night.” In this mass dream or vision Ishtar was heard to say, “I shall go in front of Ashurbanipal, the king whom I have myself made.” And so the army, Ashurbanipal added, “put their trust in this dream and crossed the river Idide safely.” (Luckenbill, Ancient records of Assyria and Babylonia, 1968: section 807). Ashurbanipal’s own record of his vision of Ishtar has been extended to become a vision experienced by an entire army on the march! Example 2: A famous example of a vision report of mass hallucination concerns the famous Christian convert, the Emperor Constantine. Eusebius writes a biography of Constantine, which is ‘historical’ by the standards of his day, yet reports that when Constantine “was praying with fervent entreaty, a most marvelous sign appeared to him from heaven” (Eusebius, Life of Constantine, 1.28). The famous sign in the sky was a cross of light, with the inscription, “Conquer by this”. Eusebius goes on: “At this sight he himself was struck with amazement, and his whole army also, which followed him on this expedition, and witnessed the miracle.” Eusebius expressly claims that his ‘historical record’ of the event was derived from no less a person than the Emperor Constantine himself, with whom Eusebius had spoken about the miracle. Most interestingly, Lactantius writes a near-contemporary account of Constantine’s same experience. But it is significantly different. Lactantius’ early account places the vision of the cross in Constantine’s dream, and on the night before. So, Constantine’s vision is not shared by his army and it is a nighttime dream rather than a vision. Even though Eusebius had spoken directly to the central eyewitness, Constantine himself, the Emperor and/or Eusebius had managed to transform the earlier individual dream report into a mass vision report! Example 3: And here’s another example. According to Plutarch’s historiographic Lives, when Alexander was besieging Tyre, “many of the Tyrians dreamed” a dream “that Apollo declared he would go over to Alexander, because he was displeased with their behaviour in the town”. Not coincidentally, Plutarch also records a dream that Alexander personally experienced, which ‘prophesied’ the same outcome. Again, in dream reports such as these, we can identify a tendency for individual dream reports to seep over into mass dream reports! Example 4: As a last example, Sefer Chasidim records a dream dreamt by “all the townspeople” of a certain town. A saintly sage complained to all the (Jewish) townspeople — making his complaint within the townspeople’s dreams — that he had been buried next to an evildoer. So the townspeople placed stones between the two graves to get him out of their dreams. But the evidence demonstrates this claim is either quite false or misses the point. Individual vision reports could and did develop into mass vision reports and could and did get assimilated into ancient histories and bibliographies as though they were factual and true. As a result, ancient histories and bibliographies contained accounts of mass visions which, in fact, were entirely fictional. The pop-apologetic argument against mass hallucinations and visions should therefore be turned on its head. When we are confronted with miraculous stories in ancient histories and bibliographies which have plausibly been derived from vision reports, there is an expectation that the vision reports have a tendency to mutate from individual vision reports to mass vision reports. There is an expectation that vision reports would change, get more exaggerated, or be altered to fit the requirements of the author. And this expectation holds, even when (as in the case of Constantine), the vision report was derived from an eyewitness. The most plausible explanation for the accounts of the sightings of Jesus, therefore, is that they derive from individual vision reports, which over time have been transformed into reports of mass sightings of Jesus. Such an explanation has the support of comparative historiographical evidence, and persuasively accounts for the evidence we find in the New Testament. * In religious experiences, anthropologists and biblical scholars agree that “dreams” and “visions” are largely interchangeable. That is, there is no significant distinction to be made between them. Says biblical scholar Francis Flannery-Dailey: “terms for visions and dreams are used interchangeably in Hellenistic Jewish texts” (2004: 129). Says anthropologist Ekira Bourguignon: dreams and visions are “interchangeable in serving as authority for religious innovation” (2003: 136). Says Stroumsa on the early Church: “In early Christian discourse, there is no way of distinguishing clearly between dreams and visions” (1999: 189). Say Kroll and Bachrach on medieval dreams and visions: “dream visions clearly have the same status as all other types of visions” (1982: 46). This entry was posted on September 24, 2008 at 4:16 am	and is filed under Gospels, Jesus & Christ. You can follow any responses to this entry through the RSS 2.0 feed. Both comments and pings are currently closed. Excellent article. I”m sure that Priests and Kings in times past, at least understood the power of suggestion and superstition amongst the general populations. Ideas of what was expected of them could easily be inserted into group think by the “I had a dream” method as well. Paul, writing before the Gospels , mentions the 500, but of course, the Gospels mention nothing of this event. Either it was known to be false and not included, or it was “known” only to Paul, who was wont to enjoy visions in his head about Jesus. James – Done. Free autographed copy? Dennis – Good points. Some try to identify the 500 with Pentecost, but that’s highly debatable. On pages 238-239 of Lee Strobel’s CASE FOR CHRIST, Gary Habermas discusses the possibility of hallucinations. He argues that hallucinations are very unlikely and cites Gary Collins to that affect. Hallucinations are individualistic occurrences and one person cannot cause a hallucination in another person. Habermas and Collins do not seem to realize that, then, they’re not hallucinations, but what if they’re visions, instead? Hallucinations are individualistic but visions can be experienced by multiple people at the same time. Hallucinations are individualistic and occur in individualist cultures but visions are not only shared by more than one person at a time but actually occur frequently in collectivistic cultures. There is an excellent book which discusses this, Bruce Malina and Richard Rohrbaugh’s Social Science Commentary on the Snyoptic Gospels. They discuss visions in honor-shame societies, how frequent visions are, and they can affect a group of people at a time. In fact, they believe that the appearances of Jesus to his disciples in the resurrection narratives are, in fact, visions. Too bad Habermas and Collins don’t know this! ‘Hallucination’ is often a term employed pejoratively by apologists, in order to simply pooh-pooh the whole idea of visionary experiences without considering it seriously. So I was pooh-poohing their pooh-pooh. In addition, the focus on ‘hallucinations’ is not very appropriate. What we have as evidence is a vision report, not a vision, not a psychological state of mind. When the focus is on the tendency of vision reports to multiply, to ‘double’ and redouble in new vision reports, as evidenced in ancient history and ancient biography, there is solid comparative evidence that multiple appearances of dead people are are result of the expected functioning of visionary reporting. Thanks for the Malina reference on visions, I don’t think I’ve come across it. I agree that using later Gospels as the basis for interpreting the ‘young man’ as an angel is not secure. But Neaniskos refers to an angel in 2 Macc 3.26 and Jos Ant 5.277. The white clothes connote exalted (angelic) humanity in Rev 7.9, 13-14. In his manner and message he acts as a mediator from the heavenly realm. So, it’s safe to conclude he’s an angel. If the resurrection of Christ was just a mass hallucination, why didn’t either the Jews or the Romans produce His body and put it on public display for all to see? More than that, when Jesus resurrected, He did not just appear in mid-air and then leave. I’m actually saying there were mass vision reports, which probably developed (fictionally) from earlier individual vision reports about Jesus. I think it unlikely that there were in fact mass visions of the resurrected Jesus. In first-century Jewish thought, men who ascended into the heavens would have to have taken on, or been transformed into, a ‘heavenly body’. An earthly body was only for this earth, but a more and more heavenly body was required in oder to pass through higher and higher heavens. 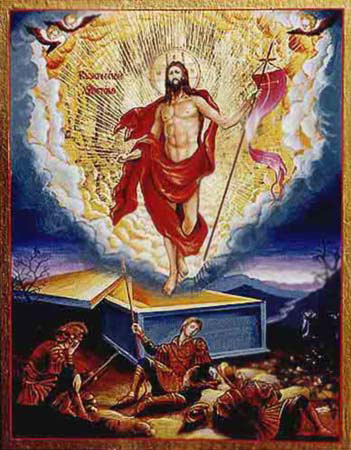 Given that the earliest claims about Jesus’ ascension into heaven were Jewish claims about Jesus, the fact that the old earthly body had been left behind in the earth probably did not even concern them. Yet, by the time the Gospels are written some decades later, and for an audience that included several goyim, it was also being claimed that Jesus’ earthly body was physically absent from the tomb. This is plausibly explained as a later embellishment of the original visions of the heavenly Jesus. That is, the early stories of people seeing Jesus alive after his death, in a glorious heavenly body, were later filled out with historicizing detail when they came to be written up in a work of ancient biography-theology such as the Gospels. A subjective vision had by Mary Magdalene later became interpreted as objective historical waking-life fact. In later historicizing embellishments of the vision reports, Jesus could even be touched and could eat food. Of course, by the time of this historicizing activity, Jesus’ earthly body was decomposed beyond recognition. Its remains may even have been cremated and put in an ossuary. Whatever the case, there was no body available to ‘produce’. In any case, I’m not sure why any authorities would have wanted to ‘produce’ the body. They probably weren’t very interested in the esoteric ideas of a small and politically harmless Jewish sect. Thanks for the amazon review. I’ll gladly give an autographed copy, a personalized e-mail expressing profuse gratitude, whatever. I really appreciate this post and your blog in general. Apologies for very likely completely misrepresenting you on mine! Seriously, I am grateful for Christian Origins scholars who are making their thoughts and their work in public and in language non-professionals can follow. It is a great service. I think its plausible but not against another hypothesis, reading it as a fact. The vision thing was dealt with in the story of doubting Thomas, Paul had different appearances than the other disciples. Also what is lacking on this thread is the explanation of why a vision bread a full blown belief system rife with persecution? Hi Rev. Phil, glad you worked out how to join us here. After all this time, I don’t think it’s possible to get more than ‘plausible’ on any hypothesis about the stories of Jesus’ resurrection. We do know that ancient historiography mixed together miraculous visions with mundane reality, treating both as ‘real’. 1 Corinthians 15 (certainly) and Mark 16 (plausibly) does so, too. So, that the resurrected Jesus was a vision is plausibly the facts of the case. I consider, given some of the details (such as the women, especially Mary Magdalene), that this is more plausible than other hypotheses of ‘what really happened’, for example, the resurrection being invented from whole cloth, etc. The Thomas story is most valuable, in that it definitely foregrounds the issue of Jesus’ physical reality. But remember – one can still have a vision of a physically resurrected Jesus. And John is the last of the Gospels, alloweing much creative development. The story of Thomas is instructive to those Christians who were not among the first generation of Christians, and who did not claim to believe based on a personal vision (as Paul did in 1 Cor 15) — it tells them, basically, ‘believe without first-hand evidence!’. If we take the Gospel of John as a much later gospel than Mark’s (as do the majority of scholars), which includes more developed traditions, then it is the product of considerable theological development and reflection. As to why the resurrection vision reports ‘bred’ a ‘full blown belief system’, with persecution, I think that’s quite straightforward to understand. The visions of Jesus’ glorious ascension to Heaven were as real, if not more real, than anything the earliest Christians had experienced. This provided them with the faith to continue to teach what Jesus had taught about the end-times, his status as supreme divine intermediary between humanity and God, as eschatological Judge, and the elect status of those who belonged to their sect. It was a winning formula! (1) I don’t read 1 Corinthians 15 as a vision? Its an appearance of Jesus to Paul. I think the vision explanation needs greater support. (2) The vision giving them the “faith gap” that they needed seems weak. Firstly because vision usually occur though not entirely originate from the past, not new future unheard of conceptual things. Secondly, all of the disciples were not looking to continue on, their messiah was dead and that was that. It was only after the appearance of Jesus that Christianity stormed forward. Intellectually it made sense only after the resurrection, therefore the psychological hole needed requiring the “faith gap” it appears was not present? I don’t see a psychological need between the death and resurrection of Jesus. Well, you might not read 1 Cor 15 in light of the Damascus Road experience (a vision), but there’s plenty that do. So, unless you’ve got an exciting new point in this old argument, I’m going to go with the obvious explanation, and relate 1 Cor 15 to Paul’s Damascus Road experience. As for your second point, I think you’re trying to say that visions are derived from one’s past beliefs. I quite agree, and this is what makes the explanation of the resurrection as a vision a particularly strong one. Jesus claimed to be the Son of Man, who would be raised to a special place in Heaven beside God. It was this claim which his followers saw (in visions) to be fulfilled. They saw visions of him at the right hand of God. Jesus said it. The disciples ‘saw’ it. Mary grieves for the dead Jesus at the tomb. Mary sees an emptied tomb, the defeat of death which Jesus had promised. This is all very much in line with Jesus’ apocalyptic message. Your point about the disciples being discouraged after Jesus’ death requires a complete and utter turnaround from their previous eschatological fervour and belief in Jesus as Messiah and Enochic Son of Man. That is quite improbable. You underestimate the deep psychological effect Jesus had on them during their lives. Whatever temporary disappointment they experienced in Jesus’ dying, which seems to be contrary to their expectations of how Jesus was to be glorified, they still had been deeply affected by the belief he was the earthly manifestation of a heavenly being. This belief even entered their dreams. In his lifetime, Jesus himself had visions of heaven, the remnants of which are obvious in his baptism account and the transfiguration. Now, at some point after his death, his followers began to ‘see’ him transformed into a heavenly being. For these reasons, and more besides, I consider that the most probable explanation of the accounts of Jesus’ resurrection was that he was ‘seen’ in visions — exactly in accordance with the exaltation of himself that he proclaimed. I mean to say – the guy had a real messaiah complex, so no wonder his followers were taken in by it. Yea but neither Acts 9 [Damascus Road experience] or 1 Corinthians says anything about a “vision.” We can quote people/scholars/neighbors till the cows come home but there is no mention of a vision experience in either Acts 9 or 1 Corinthians? Now you have made a defaming point on my blog about my failed research and miss understood knowledge would it be fair to throw the dice back in your court and ask you to look at the texts yourself? No new point here just the old one, You did not think that allegedly taking other peoples opinion and posting it in your comments was good play are you doing the same here? By the way I don’t think it makes you look good either. I quite agree, and this is what makes the explanation of the resurrection as a vision a particularly strong one. Jesus claimed to be the Son of Man, who would be raised to a special place in Heaven beside God. It was this claim which his followers saw (in visions) to be fulfilled. Sure but you have been hanging your hat on Paul? Were is his psychological reasons. He hated the church and Jesus? Furthermore what about many of the others that Jesus appeared to them that had no experience of his teachings. Paul mentions 500? Are you saying they all had an eschatological fervor that the disciples had? In addition, it seems your point hinges on the real “effect” of Jesus. Was this confidence in his miracles, teaching, example? If the miracles or his teaching then we must conclude that the disciples actually believed prior to his death Jesus was God’s Son, God. Is this your position? If so then did Jesus perform miracles? Your point about the disciples being discouraged after Jesus’ death requires a complete and utter turnaround from their previous eschatological fervour and belief in Jesus as Messiah and Enochic Son of Man. That is quite improbable. You underestimate the deep psychological effect Jesus had on them during their lives. Whatever temporary disappointment they experienced in Jesus’ dying, which seems to be contrary to their expectations of how Jesus was to be glorified, they still had been deeply affected by the belief he was the earthly manifestation of a heavenly being. This belief even entered their dream. I am not sure how you can back this up. Peter ran denied and then ran away (frightened, not what you call eschatological fervour). So did John Mark, op cit. Only one disciple made it to see their Lord on the cross, John, others were to scared, op cit. At the last supper the disciples had no idea about what was coming or the significance of it, op cit. Before Jesus’ death they totally misunderstood what was really happening, not really convinced at that supper. Only until after the resurrection do they fully grasp the belief in Jesus and who he was. The change was after the resurrection for all the disciples. It hinges on the reality or the vision as you argue or the fact of the resurrection. Now if the vision caused the change then it would have had to be the most profound and most widespread vision ever recorded right? This option seems less plausible then the actually reported facts. It appears to be a further stretch of the imagination that a vision encapsulated more than 500 people and was totally convincing to believer and non believer alike which was in cord completely with not only the example of a religious teacher but his teaching, his alleged miracles and his social life practice which in turn caused them to devote their entire life and in turn give their life under widespread persecution to it? I mean to say – the guy had a real messaiah complex, so no wonder his followers were taken in by it. Funny, why did all the Jews reject him as messiah is he had such a real messiah complex and why did the disciples take so long to recognize him as messiah if he did such a good job? Seems weak. thanks for the thought provoking post- I had to do a pile of thinking and research after your extensive thoughts here. I wished I had all your sources, but of those I have managed to get hold of so far, (ie both the constantine references and the ashurbanipal story) I can’t help but wonder if your view (and Oppenheimer’s?) is read into the texts rather than coming from them. Yes, it’s not a rotten theory, but the alternative- that Constantine really did have both a dream and a wider-seen vision, for example, is equally possible from the text. It is a presupposition against supernaturalism to say that one is more likely than the other, rather than pure historical investigation. If that’s the case, then fine, but it is an assumption, rather than an historical fact. The third example you quote (alexander), which I don’t have, I think is most persuasive, the fourth doesn’t seem to touch the subject at all. Further, I find myself swayed by the rev on the grounds that the links between these vision reports and the gospels is tenuous. With the exception of the fourth, and I think, irrelevant example, they are all about military leaders essentially gee-ing up the troops with a dream. This is not quite the same as- just take Luke- three individual circumstances where three different sets of people meet Jesus in the flesh. The comparison is stretched at best, and given that the resurrection is the capstone of all the miracles, I am left wondering how many legendary developments it is possible to squeeze into one scroll without getting the truth in there once. Finally, I think one of your posters over-stretches themselves when the crit Habermas in the Case for Christ- it seems to me that he answers their question well on p238 in debating against the possibility of legendary development. You do have a point on the straw-man of “hallucination”, granted, but I think Habermas does a good job there of knocking the two alternatives- halluciantions at the time, or legendary development of a vision report later on. Thank you for making the grey cells do overtime, though. Thanks for your comments. I’ll just note that I don’t have any ‘anti-supernatural’ assumption. It’s just that the best explanation of all the facts supports imaginary visionary experiences over real experience. The main evidence here is the scores of references to visions within the New Testament and other early Christian writings, and the regular occurrence of dream and vision reports in ancient historiography and biography. In addition, I’ll point out how dreams and visions are always tailor-made for the particular culture of the visionary. For example, when Jewish mystics have visions about the Song of Solomon, they see Torah, but when Christian mystics have visions about the Song of Solomon they see Christ. And while Catholics do not see visions of Buddha, Buddhists do not see visions of the Virgin Mary. What is the best explanation of this? The most economical explanation must be that the particular culture determines the visions which are experienced. So, it is not that I am ruling out other possibilities a priori, but only that I am ruling out possibilities not supported by the evidence. Just a corrective to your comment about Catholic visions and Buddhist visions.. In fact, the VAST majority of converts from Islam to Christianity testify to having had a vision of the risen Lord Jesus sometime prior to their conversion. This from a people who abhor Jesus, Christians, and the NT documents – and who are routinely murdered for converting to Christ. Just a corrective to your corrective… while I think the situation you describe is a true one, it does not provide any exception to my point. I made my point in very simple terms (perhaps too simple), but the point could be made in a more complex way, so as to show that your objection is mistaken. It has been well documented that “the VAST majority” of converts between Islam and Christianity already knew somebody in the faith to which they convert, and already have discussed that faith with them, whether as friends or opponents. As demonstrated by the sociological evidence, conversion usually happens after personal relationships with others in other faiths. It always happens after some contact with the other religion (my simple example assumed no such contact). So the situation in which a Muslim who receives a vision of Jesus, or conversely, a Christian who receives a vision of Muhammed, is just as explicable as the ‘simple case’ I outlined before. The point is the same — visions do not come ‘out of the blue’. They derive from concrete experiences, whether by a Catholic (eg of Mary), whether by a Christian who has been discussing Islam with a Muslim (eg of Muhammed), whether by a Muslim who has been exploring Christianity with a Christian (eg of Jesus), whether by a brother of Jesus who sought meaning in the midst of his grief for his death. All of these scenarios demonstrate the same point: The particular circumstances, experiences, and beliefs of the visionary govern the nature of his or her vision. Nobody before the twentieth century had a vision of alien races coming in UFOs from a distant planet. But visions, and the UFO-religions which derive from some of them, are ubiquitous today. Why is that? Thank you for providing these examples. I think they are all valid and quite illustrative. The subsequent discussion between you and Rev Brown is interesting. What I think is going on is that he (and his defender Jason) are approaching the issue primarily from a hermeneutic of reverence. They don’t seem to get that you are talking about genre and literary precedence, rather than trying to explain how 500 people could have the same vision ‘literally’ and simultaneously. The Rev seems to hold to the view that the stories in the NT describe actual historical events that were faithfully recorded by eyewitnesses. In this view, the symbolic figure who runs away naked at Jesus’ arrest was not symbolic, but an actual naked boy named “John Mark” (never mind that nowhere in the texts is this stated). This view also holds that, not only is the scene at the end of GJohn where “the beloved disciple” stands at the foot of the cross with Jesus’ mother an actual historical account, but also that he was undoubtedly in fact John the son of Zebedee and the author of the gospel. They can’t figure out how to look at these texts as literary compositions to be used didactically and liturgically. Where did you get the idea that Muslims “abhor” Jesus or the NT? In much the same way that I object to a defense of the historicity of the resurrection that appeals to “the blood of the martyrs” . . . . it irks me to hear this kind of thing. Personally, I think that such a presupposition is useful in trying to make sense of evidence and is a good and healthy one for people to possess in general. Why is it such a bad thing to hold to a naturalist hermeneutic when trying to methodologically and scientifically study ancient texts? I guess I’ll have to blog about that next. First off great job on the post, it’s good to see somebody delving into real historical sources to compare them to the bible. I do have a number of issues with some of your statements and conclusions however for the purpose of this post a left to limit them to just a few. I am inclined to believe that most evidence can be reasonably interpreted in different ways. When I look at all of your examples from extra biblical history, someone could easily use those as examples of how mass visions do in fact occur. Remember all four of these are written by people who are attesting to the veracity of the vision, they are not claiming that one person reported a vision and everyone subconsciously copycatted. As I said, this can easily be interpreted as supporting the occurrence of mass vision phenomenon. Your examples do not support this conclusion, in 3 of your 4 examples of extra biblical source material, mass visions occur without your individual vision report. You simply single out a primary individual and label them as the originator, even though the source material does not do that (or even imply it). In the example of Paul, he reports a mass vision of 500 people, where as Mark omits it, which reverts your conclusion because it goes from mass visions to individual vision reports (Paul likely wrote before Mark wrote ). And lastly, Mark does not even report a vision at all. You claim that he has commonalities with visions such as “sight words.” How else are we going to see something physical? It is certainly possible that the reports of the risen Jesus are from individual visions that mutated into mass visions, but its also quite possible that that explanation is incorrect. Tom – you’re right that these are possibilities. But, when sorting out the more probable possibilities from the more unlikely ones, I would simply insert the ample evidence for exaggeration of marvelous claims in certain circumstances rather than the reverse, and complete my argument by showing that it is therefore more likely that the mass vision reports derived from earlier, individual reports. At the end of the day it is not just a question of pointing out possibilities, but what is more probable, in historiography. Haha like how you never responded to the Rev and let some one else let someone else do it for you. Were Jesus’ disciples capable of differentiating between a vivid dream and reality? In the Gospel of Matthew, an angel appears to Joseph twice, once to tell him that he should go ahead and marry Mary, even though she is pregnant (not by him), and then again a couple of years later to warn him of Herod’s plan to kill Jesus and that he should take the family to Egypt. The author of Matthew tells us that both of these “appearances” occurred in dreams. If first century Jews were truly able to distinguish dreams/visions from reality, why would Joseph marry a woman who had been impregnated by someone else just because an angel “appeared” to him in a dream? If first century Jews knew that dreams are not reality, Joseph would have ignored the imaginary angel and his imaginary message. For Joseph to go through with his marriage to a pregnant Mary was a very rare exception to the behavior of people in an Honor-Shame society. His act of obeying an angel in a dream is solid proof that he believed that the angel was real and the message was real. And how about Paul’s dream/vision? Paul saw and heard a talking bright light in a dream. Paul saw the men accompanying him to Damascus collapse to the ground with him…in a dream. Paul reported that these men also saw the light but didn’t hear the voice…or heard some kind of noise but didn’t see the light…in a dream….depending which passage of Acts you read. So it is obvious that first century Jews were just as likely to believe that a dream is reality as some people do today! People have been seeing angels, bright lights and dead people for thousands of years…in their dreams…and have believed that these events are reality. So the fact that four, anonymous, first century books contain stories of people “seeing” dead people and even “seeing” large groups of people “seeing” dead people, should come as no surprise.